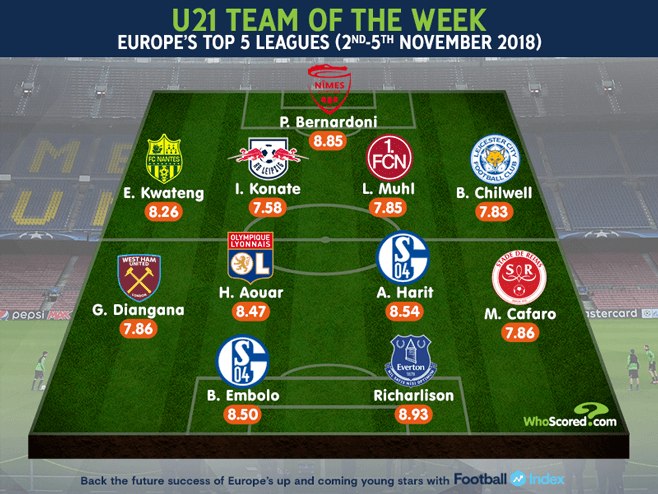 Academy graduate Grady Diangana has been named in the European Under 21 Team of the Week by popular statistics site whoscored.com. The select XI, which is comprised from players in the continent's top five leagues (Premier League, Bundesliga, La Liga, Serie A and Ligue 1) is determined by a pleyer's match rating - and the young Hammer has been included following his superb performance against Burnley. With a score of 7.86, Diangana joins the likes of Breel Embolo (Schalke), Richarlison (Everton) and Lyon central midfielder Houssem Aouar, who is being eyed by numerous major clubs. "Diangana registered an assist in West Ham’s 4-2 victory over Burnley at the weekend and should get regular playing time on the right flank now Andriy Yarmolenko is sidelined for the foreseeable future," said Who Scored. "No Premier League player completed more dribbles than Diangana (with six) over the weekend’s action. He is now yet floating on Football INDEX but keep your eyes peeled and his value will rocket." The full Under 21 Team of the Week is as follows.